1968 Merlin Red Baron Japanese Electric Guitar – Drowning in Guitars! Right here is an excellent example of the plethora of cheap guitars that could be had in the late 1960s. This is also a good example of a “theme” guitar. This is also a good example of a clean, under the bed guitar. This is also a good example of what great guitars were available to the youth of the 60s! Hmmmm, not too bad for a forgotten, dime store guitar, huh? 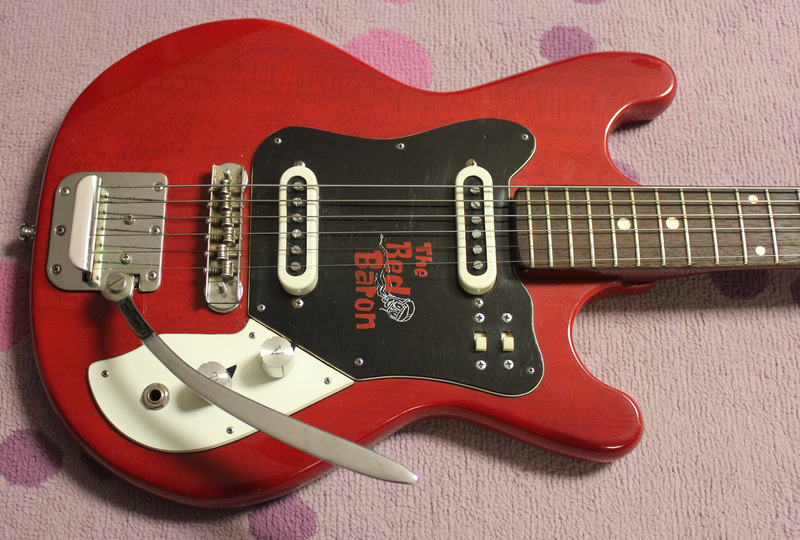 OK, so lets talk about the obvious theme of this guitar, that Red Baron. In 1966, the Royal Guardsmen came out with that tune “Snoopy vs. The Red Baron.” I’m guessing that song was some serious bubblegum pop for it’s time, so this guitar has this playful theme going on. You don’t see that too often with vintage Japanese guitars, so this guitar right here interested me right away. 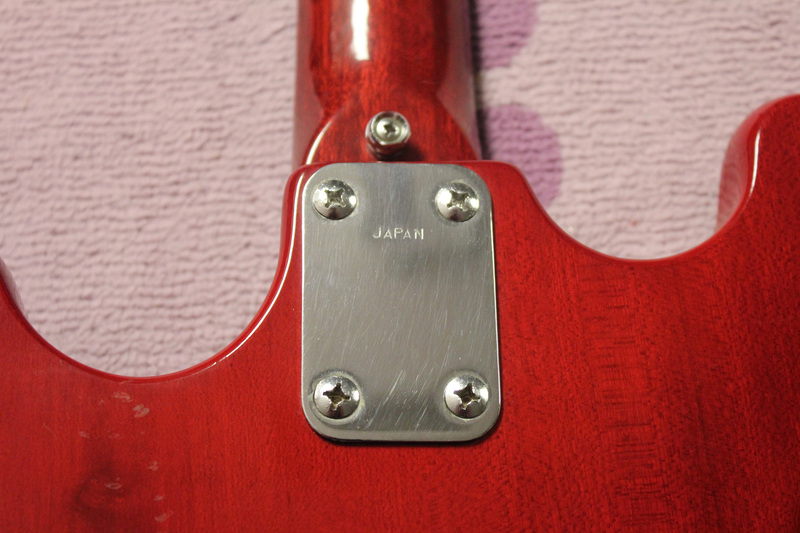 The Red Baron “logo” is impressed and painted onto the pickguard, instead of just a cheap sticker. I’d gather to reason that this guitar was made/sold in the 1967-69 range. Somewheres around there anyway. That Merlin name is one I’ve never heard of before, but after searching around the net, I came across a loose reference to these Merlins being sold through the original Lowes store, I’m guessing in and around the North Wilkesboro, North Carolina area. Could that be? Maybe someone can confirm that. I don’t know but it wouldn’t surprise me in the least. Hey, Western Auto sold plenty of guitars back in the day! What’s really cool about this guitar is how clean it is. Like, it was bought and stored, and that was the end! It must have happened to a lot of guitars back then. Can you imagine, a guitar for $43 bucks?!? I guess I should add a little context because I found that in 1969 the average weekly American salary was $91. I don’t know, $43 still sounds like a good price! Maybe that’s because a new Fender Telecaster was about $200 in the 1960s. Other random roundabout new prices in the 1960s go like this: Stratocaster=$300, Jaguar/Jazzmaster=$400, Gretsch Jet=$375, Gretsch White Falcon=$1000, Gibson ES175=$350, Gibson Byrdland=$700. That’s just a quick comparison, but you see the differences? Guitars like these were literally pouring over from Japan and were just about perfect for the budding guitarist, except that many didn’t play well at all! This Merlin is an exception though. This guitar is as it was in the late 1960s. Never cleaned or had its strings changed. It still has the wound g string! Pickups are strong, electronics work (with tiny bit of scratchiness) and the jack held up. Even the neck is pretty straight, although I’ll need to work on the neck angle. But let me tell you, today’s average salary is $650 a week (depending on the source). I defy you to find a new guitar for $325 with this kind of coolness. These guitars got soul! Maybe it’s my fondness, but have you ever tried to play some new import guitars? They are really awful in so many ways. Sometimes when I see these new cheap guitars I feel sorry for the poor trees that had to go into making them! I suppose it’s just my opinion, but I’d rather buy a vintage Japanese guitar like this, sink some money into fixing it up and play it out all the time! So here we go, check out the video demo of this time capsule guitar. I told Mike Dugan to just play it the best he could. At the time of this video, this Merlin had never been set up, cleaned, adjusted, or improved beyond what was given to it at the factory! It’s like a cool sociological experiment, if sociology only dealt with guitars. Maybe it’s a psychological experiment for me!!!! I thought that you might be interested in this. I recently picked up a Merlin Guitar, different design, mine is a re-badged Greco 921. Anyway, this is about the Merlin name. My guitar is an “Arthur Smith Country Squire” autograph model using the Merlin badge. In my research I found my way back to Lowes like you. Here’s the interesting part, Arthur Smith’s middle name was Merlin. Apparently he was involved in the promo of Merlin guitars, and Lowes (North Wilkesboro) was his backyard. So how about that!! I actually emailed this member back but didn’t get a reply, and I emailed Arthur Smith but didn’t get a reply there either. But do you want to know something that’s totally weird? Whenever Mike Dugan comes over to jam and demo guitars, he just does one straight take. He always says he lets the guitar “speak” through him. Hey, he’s a spiritual guy! But get this, when I did a YouTube search of Arthur Smith, I’ll be damned if the guy isn’t known for the “Guitar Boogie.” The actual tune dates from way back, but compare this with the tune Mike played! And we recorded our video way before I ever knew anything about the Arthur Smith connection! Kinda eerily similar, isn’t it?!?! Very COOL! I have one of these guitars myself, that I have had since the early 70’s. I’ve never fixed it up to play, but after viewing this website I think I will! That’s cool! Did you buy it at Lowes? I’m trying to “restore” this guitar for a friend. The copy I have is missing the bridge and trem arm. Does anyone have a copy of this guitar or parts for sale? I can’t find a replacement bridge. I can’t sink a lot into the resto. It’s more for sentimental reasons. I have to admit that I’m anxious to hear how it sounds! Hi Chris, that’s a noble cause and I’ll gladly help if I can. Be sure to contact Dano Dave and/or Nate DeMont for parts. You can find these nice guys on my links page. 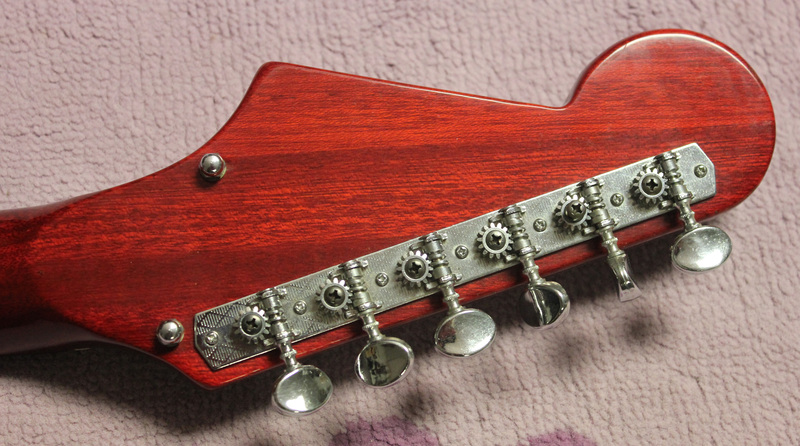 The parts you’re looking for are pretty common as far as vintage Japanese guitars go. This was my 1st electric guitar. Got one when I was 13 years old. Now 47 and wish I still had it. If anyone knows of one for sale, please let me know. 34 years and still jammin. Would love to have one to hang on the wall. The guitar that started me down the dark path to rock, according to my mom hahahaha. She wanted me to play country music. That guitar brings back so many great memories. Wonderful story, thanks for sharing! Did you buy the guitar at Lowes? I don’t really know. My Mom and Dad got it for me and an old Magnatone tube amp. Something else I wish I still had. Funny, when we’re kids, we don’t think about the sentimental value things will have when we get older. Never a truer statement made on this site. Again, thanks for sharing. Cool, glad to help! I actually have one of the hollowbodies too, but I haven’t posted the pic yet. That guitar is a cool find, not much info. out there but I’m glad you found my site. Price on these older Japanese guitars can be really hard to determine, but I’d say between $200-$300 would be a good ballpark. $20 from a friends brother, it was 1974-5-6? and ALL the Rock was comin out, first girlfriend and al the benefits, I’m 13 and staying with my aunt 2 cousins (pic) for the summer, offloading hake of the Wisconsin and Voyager of Everett Washington, the Zuanich’s boats, this job would make that show the worlds worst jobs..
they would dump the splits right in the hull which held oh say 40 cubic yards of hake, slimey bottom feeders soft mushy about 1-2ft silver like a salmon look like Ling Cod, mixed are various other species that happened to be following the schools around for whatever reasons..
the 5’x5′ square access to the hull stowage is flush with deck you slap on hip waders and jump in, sink to your hip and hope you don’t snag the ultra sharp dorsal spear off a dog fish, anywho you use a pitch fork and fill a aluminum bucket 2 square yards and it then lifted up to the dockside and dumped into a rendering truck, 50 sq yrds, the bottom of the bucket is perforated to drain, and all that glorious fish guts, blood and saltwater comes falling down upon you..
we clean it up hose it down take the cash and head for home, 5 hours you make a about 12.50 a shift for one boat, if both boats are in and you finish before the rendering trucks call it quits for the day, $.25 an hour bonus but it means hustle and hustle means MESSY, no need for supper you ate enough fish guts blood sweat and tears to last you a week!!! welp on to the guitars I suppose? we clean up, put on our best duds, were are flashy having made about $45 a week each… let me tell you!! so we get to Teri’s house and Teris spills the beans to his older Bro about the Thai stick, so Teris bro tells Teri if we don’t come down and share Teri doesn’t get the $20 for his weeks allowance… under protest we head down finger slapping Nelson ALL THE WAY..
we get done into the dingy poorly lit basement and there his bro’s room, girl in tow on his bead with T-rex “Dundalafargo?” on the sears turntable… VERY SWEET rigg!!! its a 19?? Gibson ES137DC Sunburst, I know SQUAT about guitar or playing and OBVIOUSLY Teri brother doesn’t either,it came from an uncle in an inheritance of some sort..
anywho I just cant take my eyes off it, T-Rex goin at it I am kinda the man you remember how it was back then whoever is holdin was top dog no matter what, just ow it was and if you are holdin the dank you’re a rock star straight outta the box!!! so Teri’s bro feelin the fine effects of Thailand’s finest says, hey you play guitar? I say nope never..
Nelson; says wanna buy it? Me; I’m thinking its going to be way over my head so I start to think of a payment plan but he said $20, you’ve never seen a guy pull $20 out of his wallet and count out $20 in smalls faster!!! by some odd stretch i have a job and some extra cash in my pocket, first time EVER, I am like 14-15? so it was mine, $20, not having a clue what it was and mind you there is no interweb in 1977, nothing even close, if you wanted that kind of information it was WORK, you had to hit a library, fins the man if you’re lucky then write letter place it and a self addressed stamped envelope and snail it!! yup NO JOKE, as summer ends I have to move back home for school and Eds ma meets a guy and they move to Ballard, I made the mistake of allowing him to borrow it because he would be stuck at home bored out of his mind no job no friends..
yup, I cave in and say yes, haven’t seen it since and all I have to remind me is a photograph his ma took in what year??? yup I moved to Ballard 3 years later after spending some time at my fathers in Tri Cities Wa and he was either hiding it when I came over or it was already missing, who knows where it really ended up ALl of his friends CLAM up when I mention it and his ma has pics of him playing a black LPJ around that same time, my guess is he either traded it or sold it and bought that then spent the cash? if it doesn’t show up normally maybe you can C/P the URL and paste it into a browser? Looking for a 1968 merlin red baron. If you have one please contact me ASAP. Also my first guitar. Mine was green but exactly the same. That trem bridge…! I always loved the pickup switches. What a cool axe. Never knew its background! Thanks!